In a country divided by freedom and fascism, Virginia was determined to do her part for the Allies. An ordinary woman from Baltimore, Maryland, she dove into the action, first joining a French ambulance unit and later becoming an undercover agent for both the British Office of Strategic Services and the US Office of Strategic Services. Working as a spy in the intelligence network, she made her way to Vichy, coordinating Resistance movements, assisting in Nazi sabotage, and rescuing downed Allies. She passed in plain sight of the enemy and soon found herself being hunted by the Gestapo. But Virginia cleverly evaded discovery and death, often through bold feats and escapes. 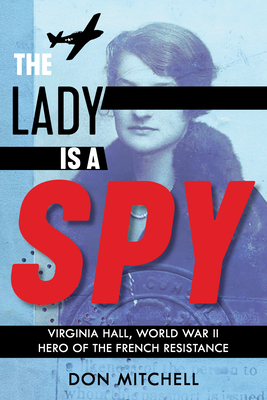 Her covert operations, efforts with the Resistance, and risky work as a wireless telegraph operator greatly contributed to the Allies' eventual win. Don Mitchell is a critically acclaimed author of nonfiction for young people, including The Freedom Summer Murders, which received multiple starred reviews and was a Kirkus Prize finalist for Young Readers’ Literature, an NAACP Image Award nominee for Outstanding Literary Work for Teens, and a Kirkus Reviews Best Teen Book of the Year; Liftoff: A Photobiography of John Glenn; and Driven: A Photobiography of Henry Ford. He has served on the staff of the US Senate Select Committee on Intelligence, as well as on the staff of the National Security Council.